Commission rates can vary by brokerage and financial product. For stocks, there are two primary commission structures: per-trade (buffet) or per-share (ala-carte). The per-trade rates are also known as flat-rate commissions. Day traders can choose to pay per share or per trade. Both commission structure have their advantages. These are flat-rate commissions that charge per trade, up to a specified maximum share size. Like an all-you-can-eat buffet, the food is sloppy and low quality (order fills) but a bargain for heavy eaters (large size traders). Flat-rate commission trade orders are routed to a pre-determined designated liquidity provider, which the broker likely negotiated an order flow agreement with. Traders usually don’t have the ability to target specific ECNs or route directly to a preferred liquidity provider, which can often result in poor price fills. While the commission rate may seem cheap, the problem lies in the poor order fills and liquidity since only a single liquidity provider may be used under the order flow deal. This can mean the difference between getting an entry filled quickly at a good price versus having to pay a higher price on the fill, or simply not getting filled. Per-trade pricing also can be very expensive with scaling in and out of positions. This is like a person with a small appetite regularly dining at buffets, but only able to consume a single plate. For example, If a day trader wants to scale out of his 1,000 share position manually in smaller 200 share increments, using a flat-fee commission rate of $9.99 per trade, it would cost the day trader $9.99 to buy the original 1,000 shares. Each sell order he places to sell 200 shares would cost him $9.99 per trade. The total of six transactions at $9.99 results in a total commission cost of $59.94. If the day trader made a gross profit of $100, the commission costs would leave him with only $40.06 net profits. Commissions would cost him 60% of his total profits. The per-trade rate benefits day traders that trade large size positions. A trader that regularly trades 5,000 shares at a time would only pay $9.99 at the flat rate as opposed to $25 at the per-share rate of 0.005/share. Per share pricing is often preferred by active day traders who plan to scale in and out of positions throughout the day. 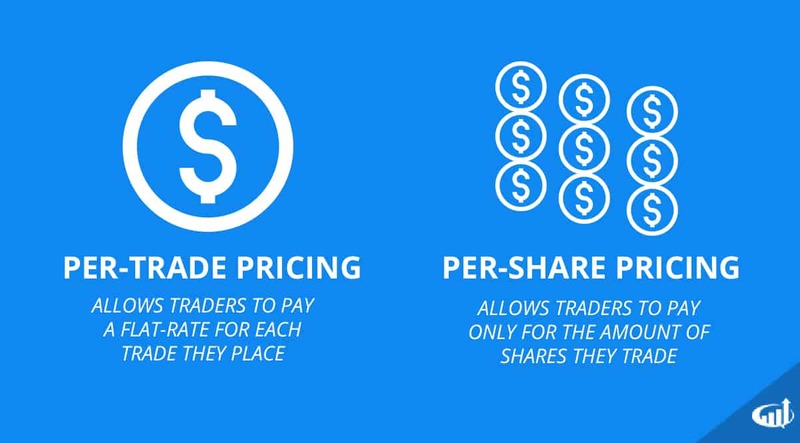 The per-share structure allows for traders to only pay for the shares they trade. This is the ala-carte version of commission schedules where a diner (trader) only pays for what he/she consumes (trades), like dining at a Chinese Dim-Sum restaurant. Naturally, traders with giant appetites will find it expensive to pay per dish. Per-share pricing brokers generally offer direct-routing access to specific ECNs, dark pools, exchanges, market makers and liquidity providers. The number of different accessible routes varies by broker. Many brokers offer their own smart routing feature that will search out the best route to ensure liquidity. The day trader using a $0.005 (half a penny) per share commission rate would pay $5 for the initial buy order filled for 1,000 shares. Each 200 share sell order would only close $1 resulting in a total commission cost of $6 for the six trades. A $100 gross profit on the trades minus the $6 total commissions would leave a $94 net profit. Commissions would only cost him 6% of total profits. This is the main reason why active day traders should be using a per-share commission schedule. Day traders that implementing a scaling order strategy, buying and selling in smaller increments to favorably adjust average share prices, are the best fit for a per-share commission schedule. Many brokers also allow for a scaled commission structure where the per-share commission rate gets cheaper with greater monthly share volume traded.